You imply the green church has all the answers? I'd suggest it is fundamentally disconnected from the reality. 1. Humans vs nature dichotomy is the norm. Humans as part of nature never even enter the thought. Something only someone utterly disconnected from nature, only someone who lives in modern city could think. 2. "West is uniquely anti-nature and pro-human". Reality is, it's the most anti-human and pro-nature. You need not look beyond how shamelessly people outside West dump their waste, or where the plastic garbage filling the oceans comes from to see that "think of the nature before yourself" attitude is utterly absent outside the West beyond a few village idiot types. 3. Strange empathy towards other species that assumes that other species can be more valuable than their own. Not a single creature on this entire planet follows this philosophy in their actions. Nor does overwhelming majority of people, luckily, as this attitude is self-exterminationist. This mindset is almost uniquely locked to the certain parts of modern Green movement, which can commonly be described as "medieval nature worship" - worship of idealized view of nature as something beautiful, that human tarnish. Without ever realising that nature in reality is the bloodiest, most brutal, most amoral and unethical state of being, by definition. This mode of thinking is utterly absent outside West, and represents a tiny and vocal minority among even the Green movement itself. It's unfortunate that it's increasingly taking over the movement, and its various forms ranging from deranged animal activists from PETA to vegan extremists violently attacking people eating meat dishes in restaurants are increasingly taking control over the movement that used to be quite close to nature and very much pro-"humans as a part of nature" narrative rather than "humans against nature" one that is advanced here. You have a fan. Hope you can deal with a kayak vest wearin, bootie sockin, bar holdin, duct tape helmet sportin, slidin the wrong style, middle aged guy understanding that you have put more simply than what I could have never articulated in under 500 words - and that is being generous to.........me. If you are "English as a second language", I am giving you a compliment. And it is probably the biggest and most sincere compliment I have ever given another human being. Keep it up, this forum could use some more reality. But be careful, this makes you a target for those "outspoken, but valuable" contributors to the forum. The only thing I would add to your statement is that these "valuable contributors" on either side, may be the "great filter" that astronomers are looking for. "Contrary to what might be expected from environmental concerns related to global warming, CO2 (carbon dioxide) health effects and benefits for the human body are innumerable. Life originated and had existed on Earth for millennia under conditions of a very high CO2 content of the surrounding air..."
Global Warming scare will dwarf every little scam on the books by yuuuge margin. It's Global, all right. Is it for better future? Check. Some sacrifices are needed? Check. Numerous activists aligned their agendas with eugenics in order to better sell their ideas. For example, I've learned that one of the most prominent birth control popularizers (Margaret Sanger?) had very hard time until she started to push it as one of eugenics solutions. Gradually, scientists support for eugenics evaporated, with no geneticists showing up at major eugenics symposium. Nazis extermination camps discoveries were the last nail in the coffin of that idea. What would it take for this global warming nonsense to die? A catastrophe on the level of Tunguska meteorite strike, or supervolcano eruption? Well, I can't let it go apparently... Suposedly 97 % (well a high percentage anyway) of scientists believes in global warming, but you know better. Another bulshit detector, or if not how do you decide what to believe ? You guys don't come up with any arguments other than that global warming hasn't been scientifically proved and historic precedent of people believing a lie, and you're proposing to risk the future of humanity on that and belittle people that do believe in global warming. If global warming hasn't been proved conclusively, the opposite hasn't either. I'm really amazed... Like I said before, some people believe the holocaust never happened, would you find those that do but hadn't personally witnessed it, stupid as well ? Belief is not the same as reality. And no, I am not a Holocaust denier. Do I believe that anthropocentric global warming is not happening? No, I do not believe that. I am simply looking for the reality in a system that is too complex to come to a conclusive answer yet. To some, that is blasphemy. And being accused of blasphemy is the best indication, that their position is a religiously rooted in "belief", but not the objective reality. Ok, we can agree on many things then. I guess global warming is a belief and not necessarily a fact/reality. Obviously the oposite is also. And some people do get pretty excited about an issue and also with those that disagree on their belief. As a side note, my comments weren't directed at you. Speaking in kiting terms, your timing is off. This is not the best time to claim scientific authority over the issue. Witness the beer story making this week headlines. Tell me it is not a Barley Science. Let's examine their research. They fixed dozens (if not hundreds) of beer growing variables, except one: temperature. There is nothing wrong with it, that is what scientists routinely do in order to distill the dependency on individual factors. However, how much prediction power their model (experiment, whatever) has? Zero, because numerous other beer growing variables are more significant than temperature. 1) Can you see China entering WTO in 2000 and the brake neck industrialization in this graph? 2) CO2 IR forcing is algorythmic and after certain point it does f-all. We almost doubled CO2 with no negative outcome, so from now on, plants and us can only get better. 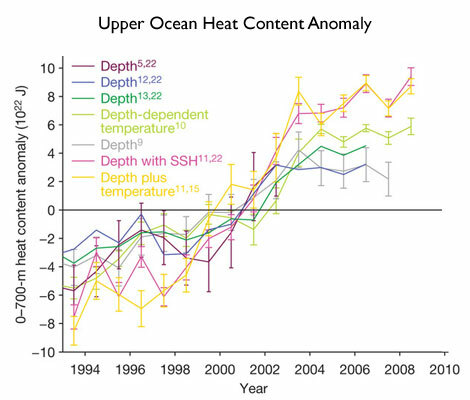 4) The recent warming can be entirely attributed to oceans since that's where the energy came from via ElNinos. How CO2 puts heat into the Oceans? What is the only thing that can do that? - nobody has the balls to say it, even skeptics, because in science if you're wrong you're history. Smells like we're back to Marlb's shocking winds ! !